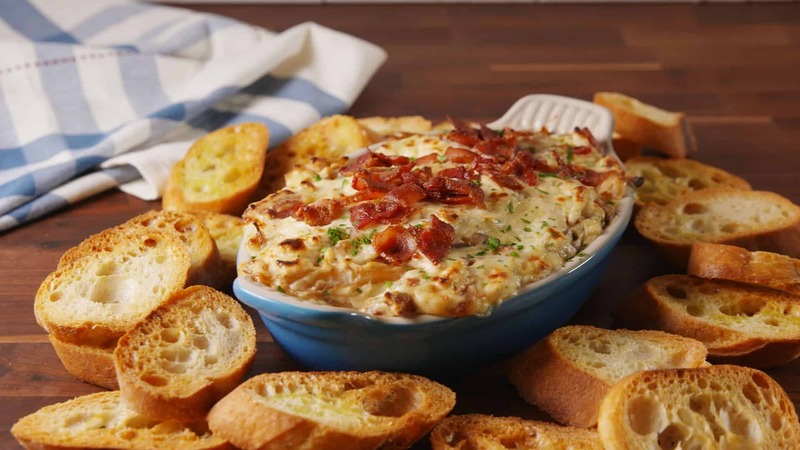 Cheesy Caramelized Onion Dip is a delicious party appetizer and pairs great with your favorite crackers, chips or toasted bread. In a large skillet over medium heat, cook bacon until crispy. Drain bacon and set aside, reserving about 1 tablespoon of fat in the pan. Melt butter in the same pan. Add onions and cook until soft and golden, about 10 minutes. In a large bowl, combine cream cheese, sour cream, Worcestershire sauce and garlic powder. Beat with a hand mixer until light and fluffy, then season with salt and pepper. Fold in cheeses, crumbled bacon and onions. Transfer to a small baking dish and bake until bubbly, about 20 minutes. Garnish with parsley and serve warm with bread for dipping.